In this blog, you will see how to get the current SharePoint Online list item version using PnP PowerShell. 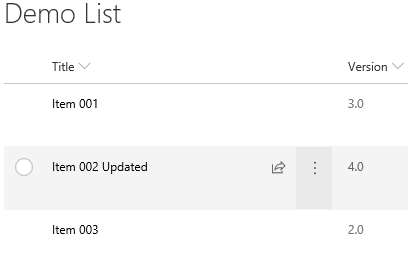 I have created a custom list named “Demo List” in which versioning is enabled. You can download setup files from the releases section of the PnP PowerShell repository. Copy the below script and paste it in a notepad. Save the file as GetCurrentVersion.ps1. Thus in this blog, you saw how to get the current SharePoint Online list item version using PnP PowerShell.